Please be at Nagawukee Park no later than 12:45, so that we can warm up prior to our match. DIRECTIONS: Take I-94 west to HWY 83 in Delafield. Nagawaukee park is about a half mile North on your left. Congratulatiosn on making it to the finals to compete for the State Title and on earning a spot at the Midwest Tournament this Spring!! DIRECTION: go South on Moorland Rd- Take Moorland Rd south until the Janesville Rd intersection. Continue south on Moorland passed Janesville Rd and come to a four-way stop (with stop signs). This is Moorland and Woods Rd. Continue south through the stop on Moorland and about a half mile down you will see McShane Dr. on your left hand side. Take a left onto McShane and go about a half mile and Bluhm Park will be on your right or the south side of the road. Directions: Take I-94 west from Brookfield; Exit onto WI-16 (exit 293C). Continue on WI-16 to Exit 179 (Hwy. C toward Delafield/Nashota). Turn rogith at Lakeland Dr. Park entrance will be on your left. Remember, this is a Waukesha County park. You will be required to pay park admissions to enter the park. Here are the details for Sunday! Car Pool: If you would like to car-pool, we will be leaving from the parking lot of the Flemings Restaurant at Brookfield Square Mall at 12:15 tomorrow. Otherwise, see you at the pitch. Take I-94 East, South onto I894, and back onto I-94 South towards Airport/Chicago. Turn right on Howell Ave - going south. Keep left. Continue south to College Ave. Turn left going east on College Ave. This tournament is part of the Scottish Highland Festival. Admission for players is included in the team's tournament fee. Other fans, however will need to pay the admissions price. The playing fields are a far walk from the parking lot. Players should be on the side-line ready to warm up at 8:00 a.m. Our first match is scheduled against Catholic Memorial at 9:00! Please arrive at the Expo Center no later than 7:30 a.m.! Our matches are 1/2 hour long and are scheduled on the hour until 2:00 p.m.
WHERE: Town of Vernon Park and Recreation Department,W24 S8910 Center Dr. in Vernon, WI 53101. We will be playing an informal scrimmage/practice against Vernon this weekend. I expect that we will be practicing for no more than 2 hours from kick-off and done by 3:00 p.m. As this is not a formal match, there will be no after-match social. Take Greenfield Ave. west to WI-164. Turn left onto WI-164 and follow it all they way around Waukesha, south towards I-43. Take a left on Center Dr. Continue on Center until you see the Vernon Park and Recration Department on your left. Enter on the second driveway to park by the field. Aug 30 Pre-season scrimmage v. Vernon (at Vernon Park) 1:00 p.m. Thanks to Adriana for capturing the Seniors' final cheer! What great final games with both the A-side and B-side, not only winning, but playing some top form rugby! We will miss the seniors -- but Friday night also showed that we have a very bright future. 37-5 B-side over Oak Creek U16 and 25-0 A-side over Muskego. p.s. Thanks for the gift. I look forward to our final summer 7s with the seniors and a very competitive fall for the rest of the team! 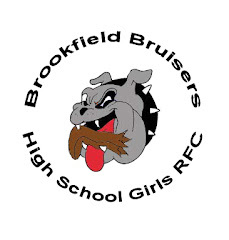 Brookfield Bruisers ... always well dressed for every occasion. I hope everyone enjoyed the last practice of the season! DIRECTIONS: Do I really need to post directions? Just and F.Y.I., the tentative Fall schedule will be posted by the end of the week!! WHERE: King Field (near Marquette University). DIRECTIONS: Take I-94 east to 35th Street (Exit 309-A). Head North on 35th St. and take a right on W. Highland Blvd. Take a left on 17th Street... King Park is on your right hand side of the road. There is parking along the street on 17th Street. There will be both an A and B side match. We are the host team, so we do need to provide food for the post match. Henna will be discussing details about the post-match food at practice today. Here are the match details for Saturday. WHEN: 9:30 a.m. kick-off (Be there by 8:30 a.m.)! DIRECTION: Take US 45 North. Exit at Exit 48 (WI-145). Turn right at end of ramp. The Dretzka Park entrance is about .4 miles down the road on your right. The field is right by the entrance of the park. We will play our A and B matches back to back and would anticipate that we will be done by noon -- right after the social. Here are the details for our May 3rd Matches for the Rugby Border Battle in Mauston, WI. This is approximately 2 1/2 hour drive. To be there and ready to warm up by 10:00 a.m., we will need to leave Brookfield by 7:00 a.m. -- so I wanted to get the match information out early. I anticipate that we will need drivers, so next Monday at practice, we will need an accurate count of who is going and whose parents might be willing to drive. Players should be at Minooka ready to warm up at 8:45 a.m. Thanks to all the parents for driving and coordinating and getting us all there and back again! The Club had a very successful trip to Iowa this past weekend. We were able to play a lot of rugby and gain some valuable experience. Our final record was 2-1. We posted a 50-0 win over Edina; 10-0 win over the Orono Nightmares and a 0-5 loss against Hopkins. In all three matches, we had the pleasure of playing against quality opponents from all over the Midwest in some very physical and demanding match-ups. In addition, our players did some fantastic extra-duty assignments filling out Omaha, Hopkins, the Kansas City Dragons and forming part of a motley side to do our part to make sure there was rugby for everyone! I am very proud of our efforts on behalf of these other teams both in the quality of our players' performances on the field and their sportsmanship in lending a hand to these other clubs. The First Match and some reminders! Despite the cold, our club showed up ready to play on Sunday to put up 50 points in our first match against Pius for a 50-7 victory in a scrimmage format. Our A-team racked up 40 points in 20 minutes as they cut through the opposition! A special congratulations to our rookies who really came alive to the game -- making shoe string tackles, penetrating runs, and generally dominating play for 40 minutes as they took the field for the first time. The club should be very proud of where they are at as they start this season. Having 2 full sides ready to play is a major accomplishment and the first step towards building a sustainable power-house club. Every member of the team should be proud of this as we continue to build the club. IOWA: At this point -- with the addition of 2 drivers volunteering to drive on Sunday -- we should have all the space in the car pool for Iowa that we need. I will be sending out more detailed information to drivers in the coming days. A quick update about Sunday's Game: Rockford, Il. is coming up to play our B-side so there will be both an A and B side match and everyone will get an opportunity to get in a game. This is a great opportunity for the rookies to get their feet wet. The B-side game will kick-off immediately after the A-side game. Don't forget dress warm for being on the side-line in case the weather turns cold! TIME: Kick-off 1:30 p.m. (be at the field by 12:30)! Due to the cold, we are cancelling practice today and Thursday. Practice will begin on Monday! Just a reminder, practices are Mon., Wed., and Thrus., from 4 to 6 p..m. at Brookfield Christian School, which is located on the corner of Burleigh Rd. and Lilly Rd., just south of Brookfield East High School. Don't forget your mouth guards and cleats! Please pick up information including registration papers, a calendar of events, and apparel order forms AFTER SCHOOL on THURSDAY, February 26th in Mrs. Simek's room across from the Library. If you can't make it, please let me (Liza Lemkuil) or Henna know so we can get you some copies.